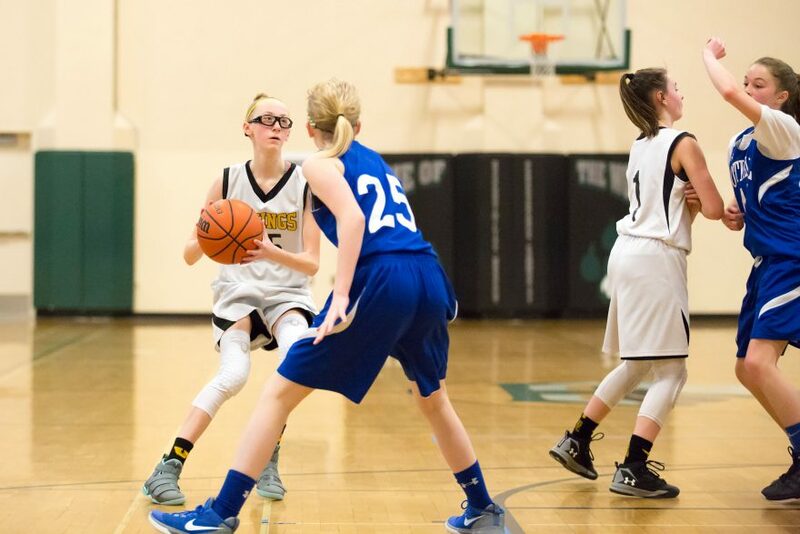 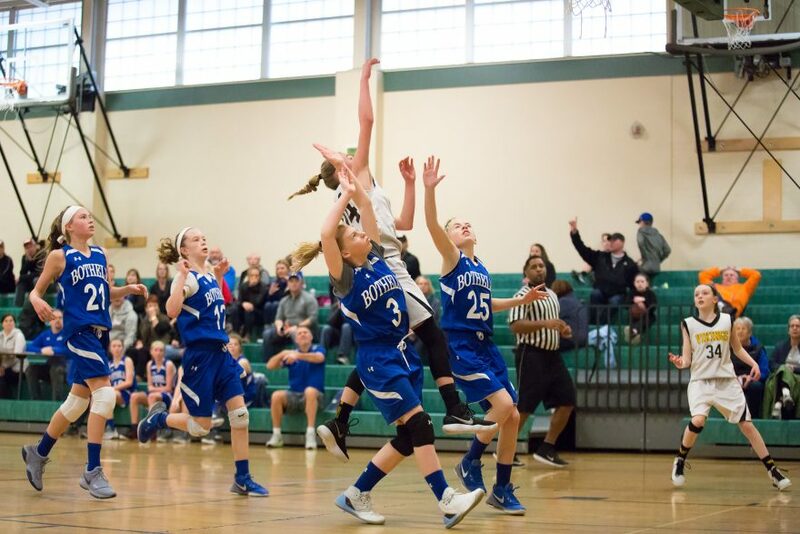 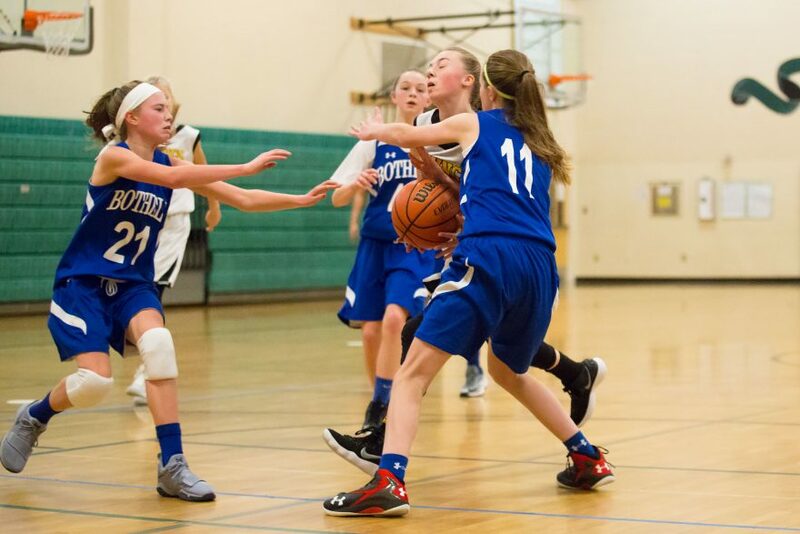 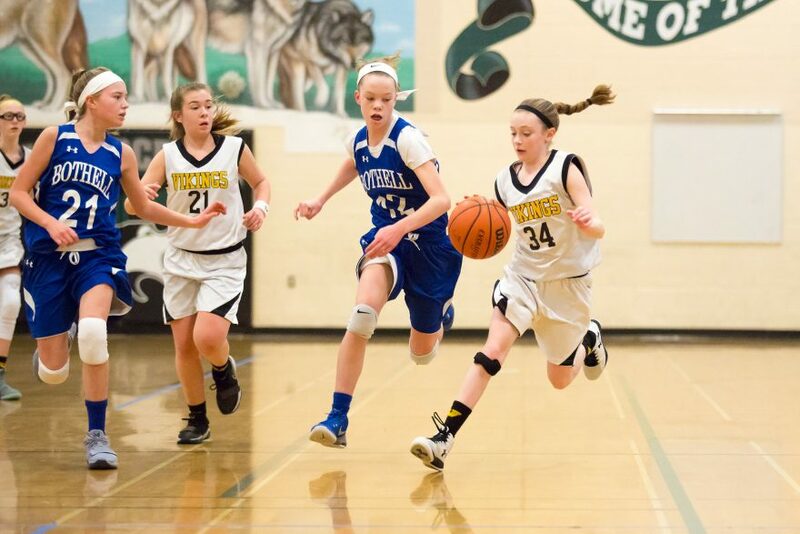 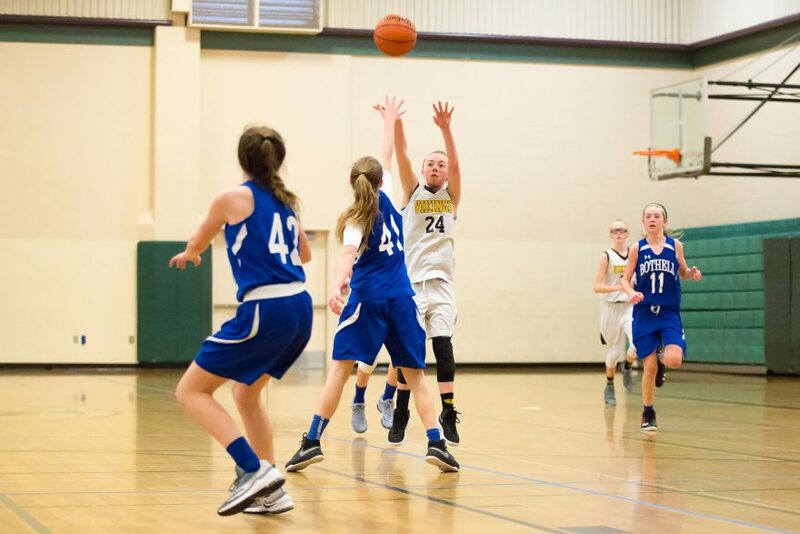 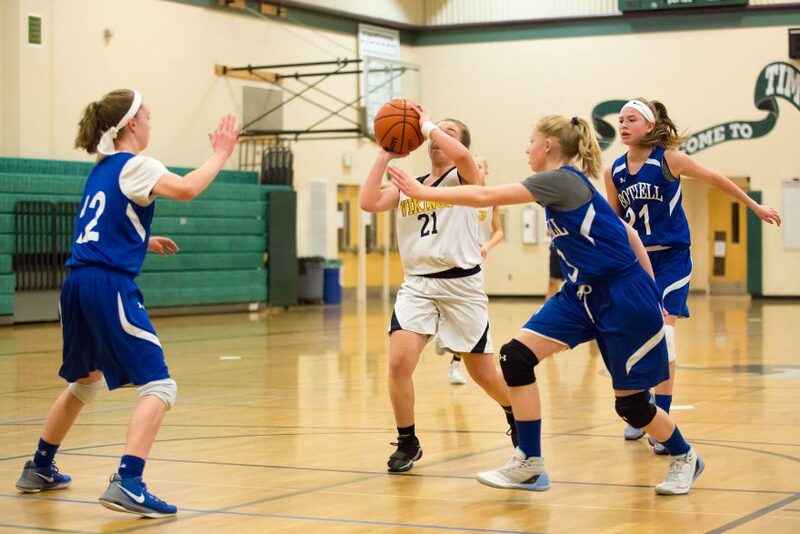 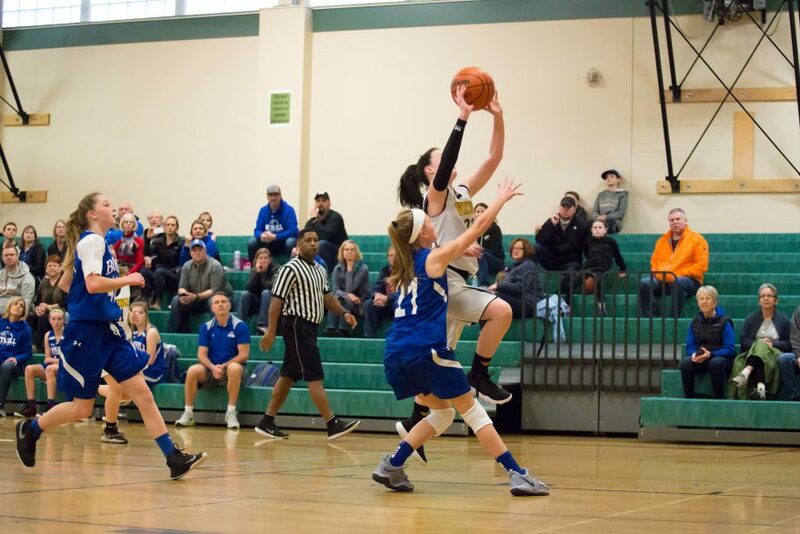 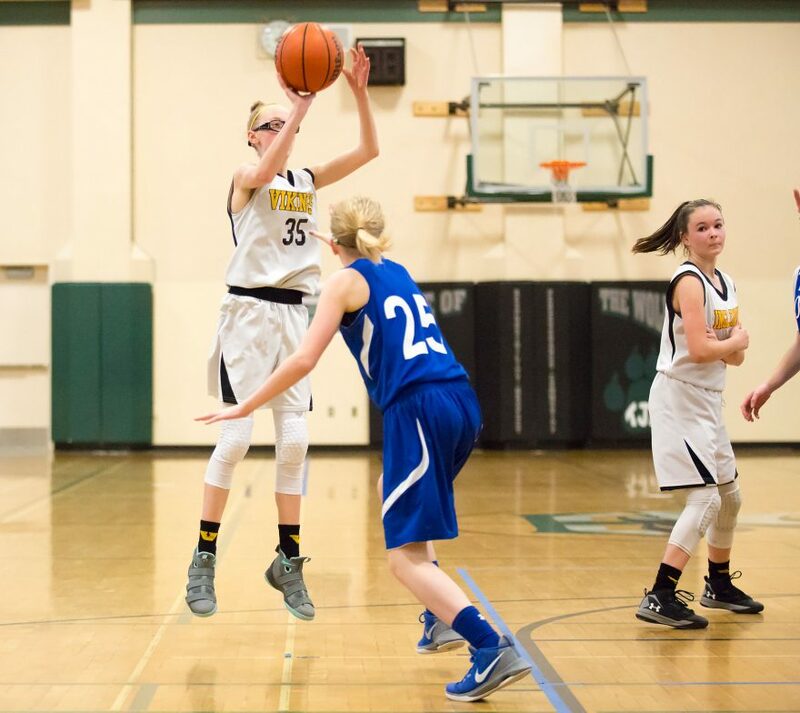 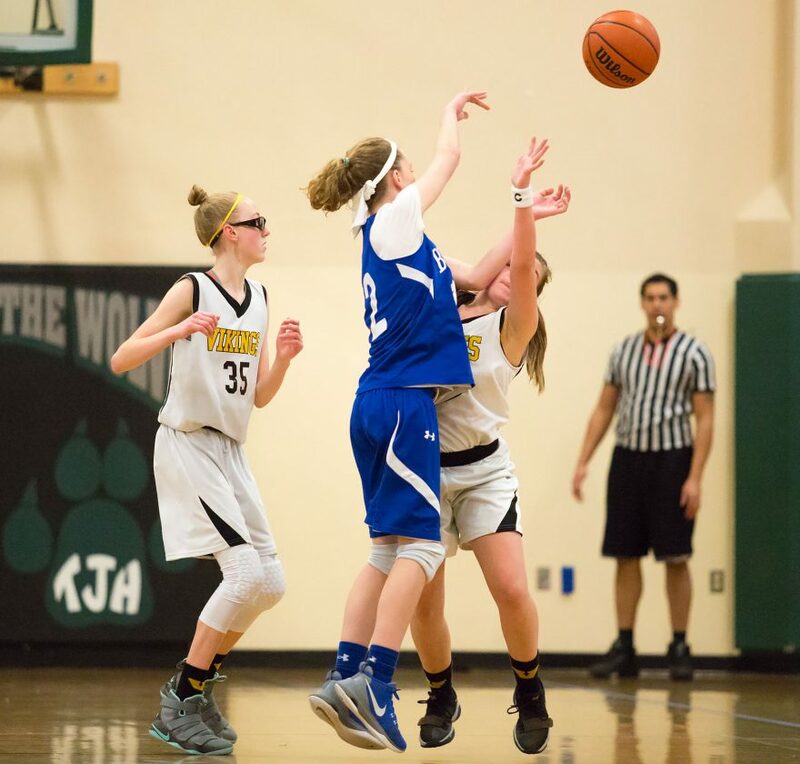 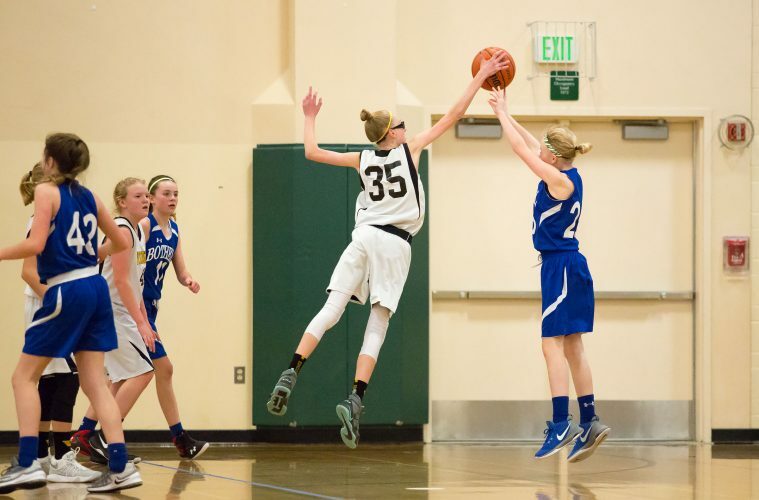 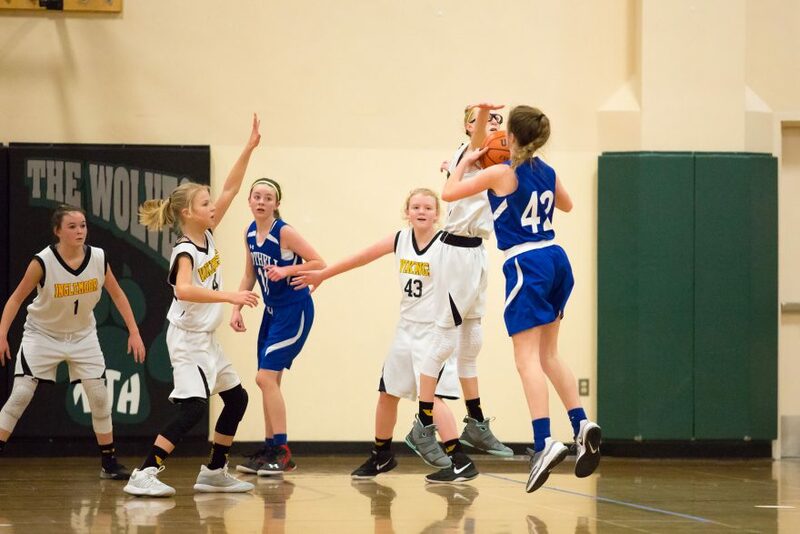 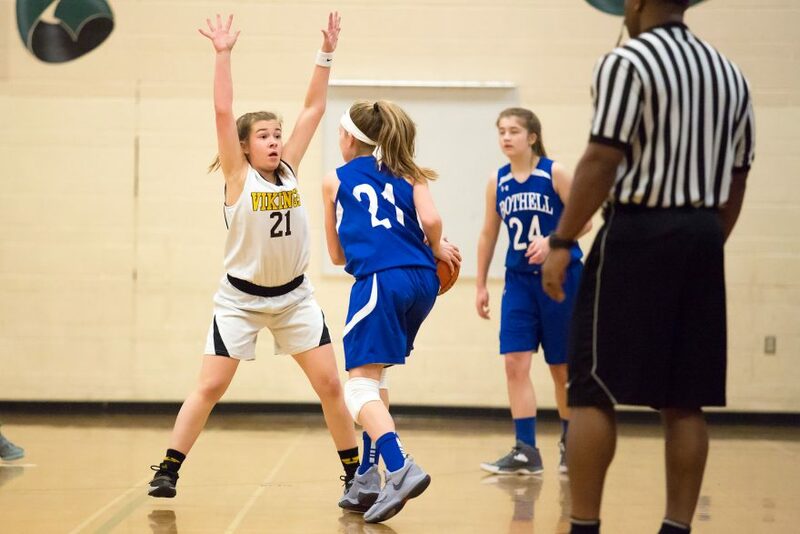 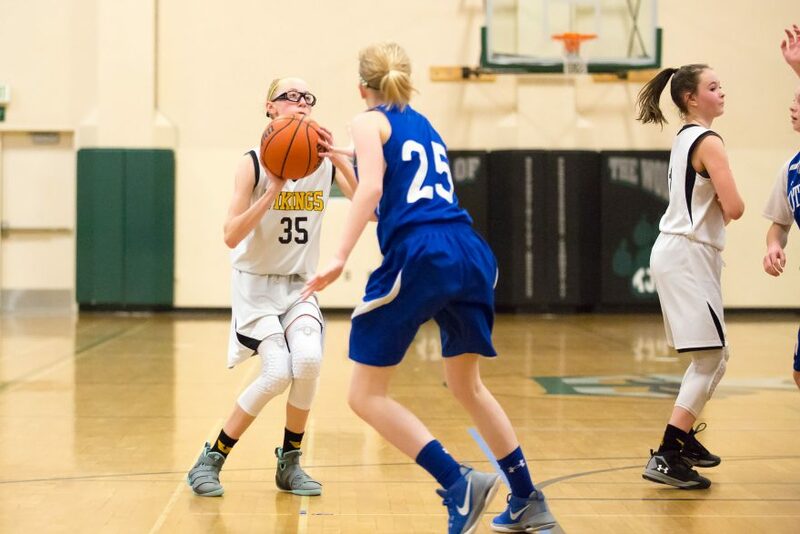 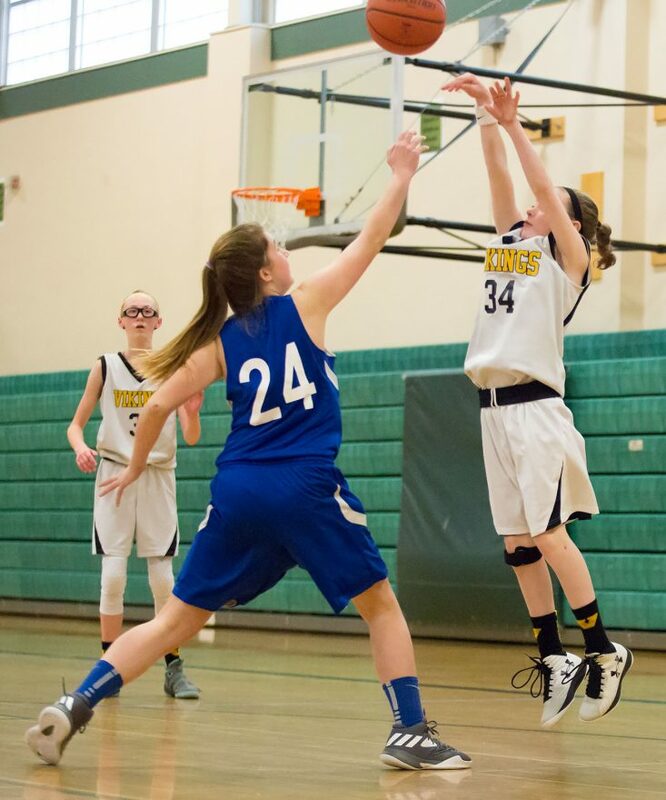 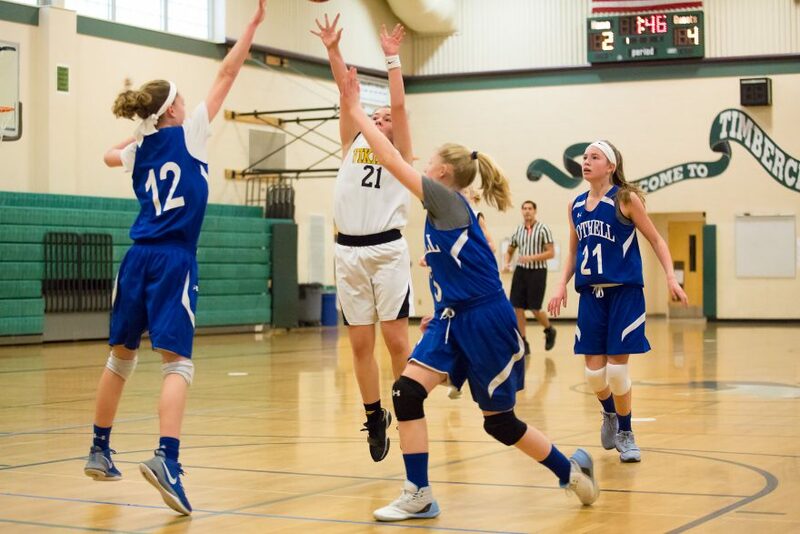 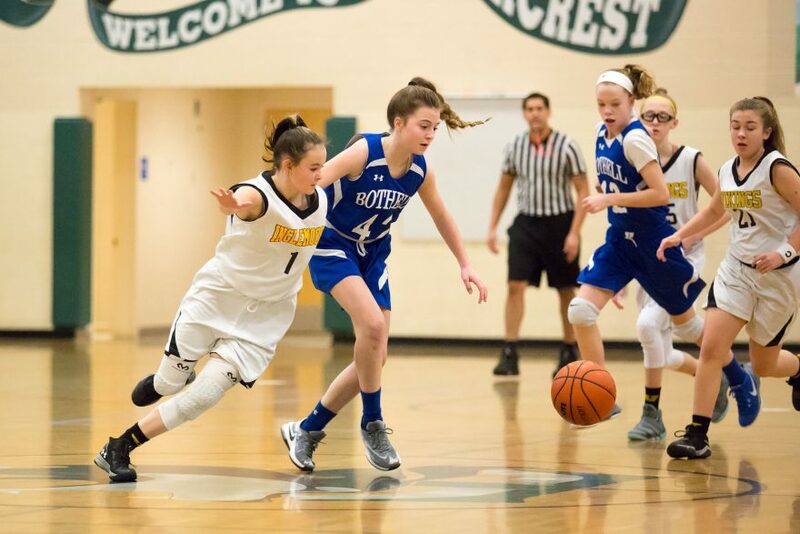 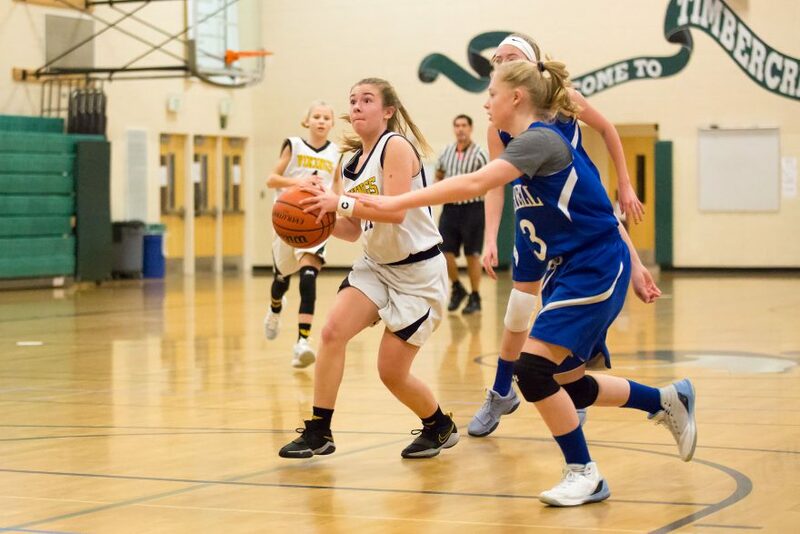 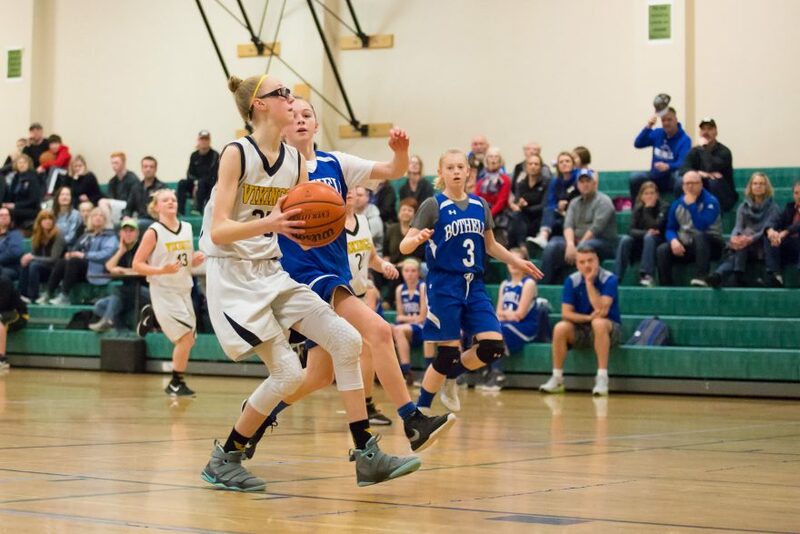 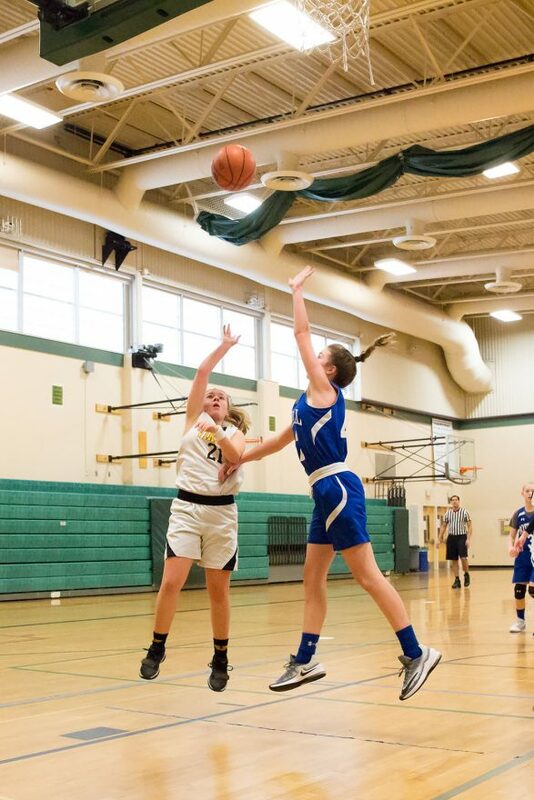 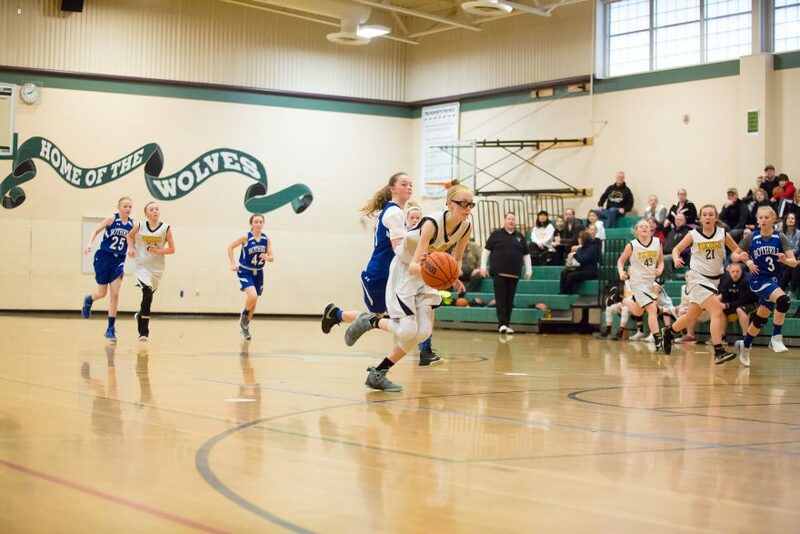 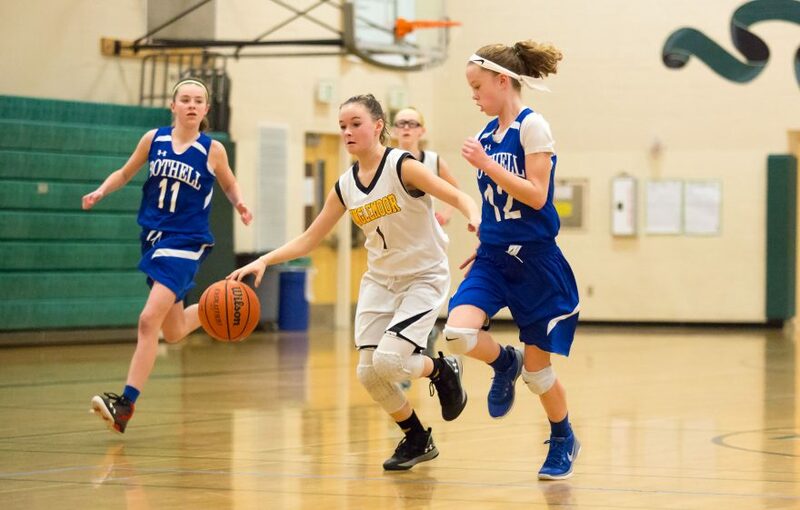 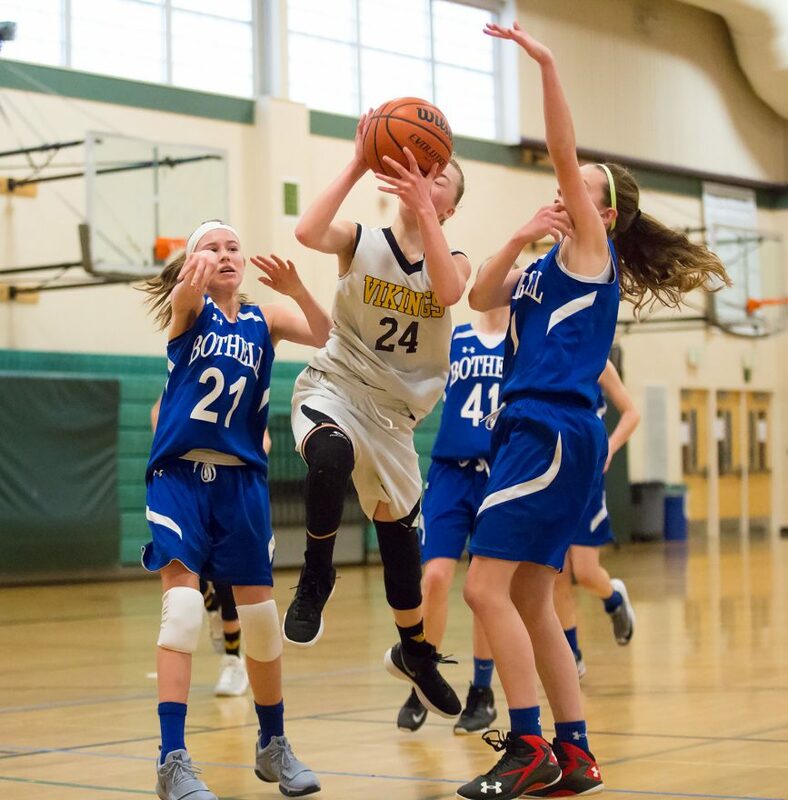 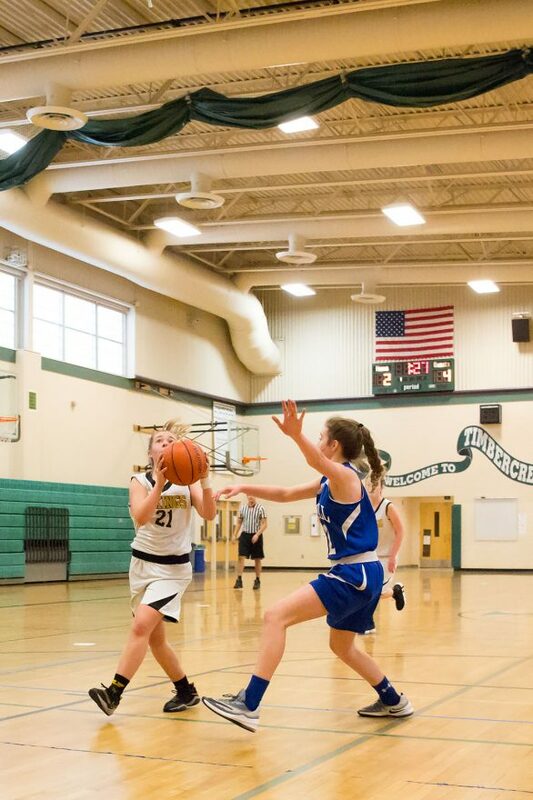 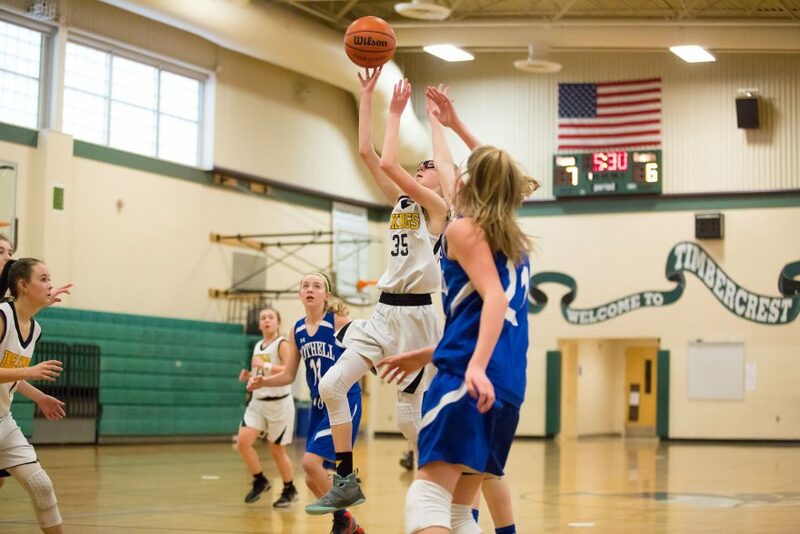 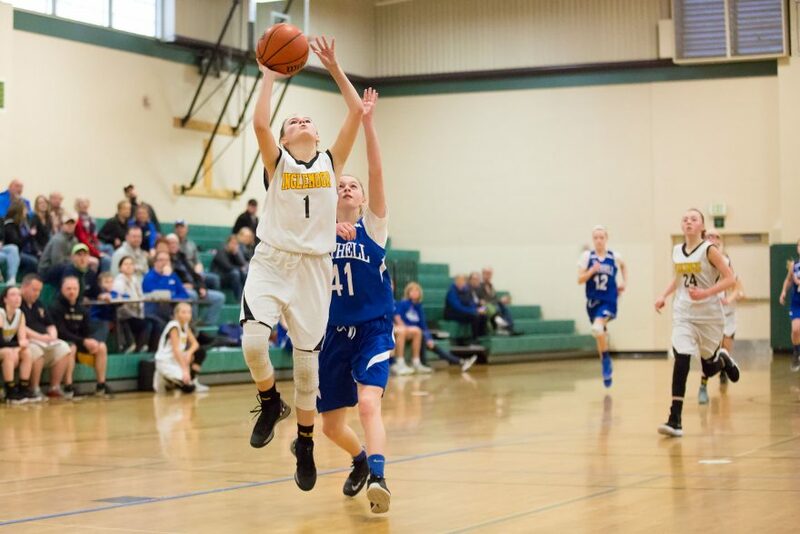 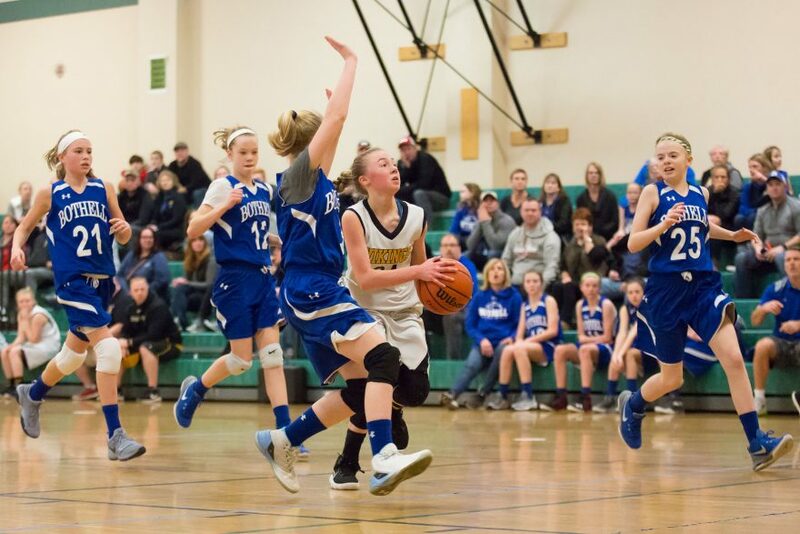 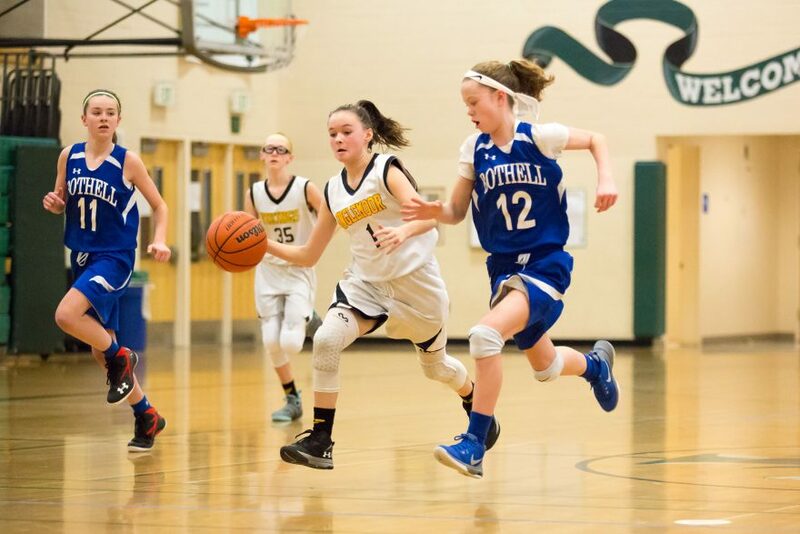 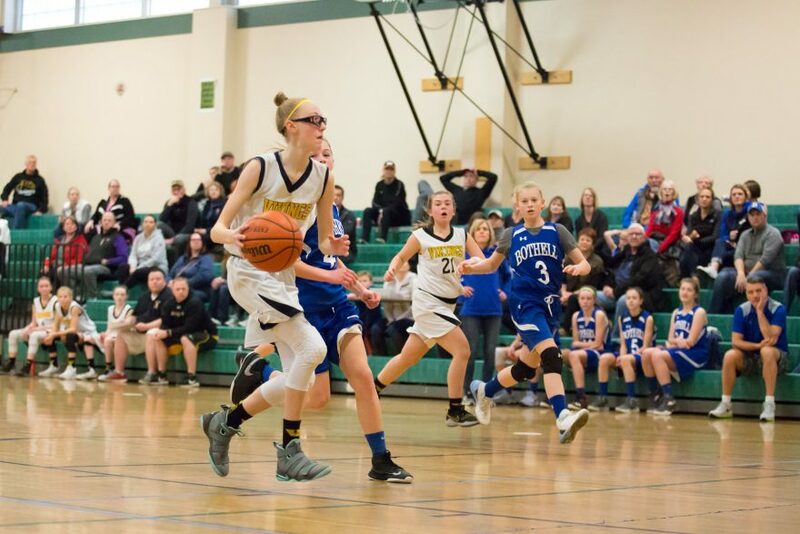 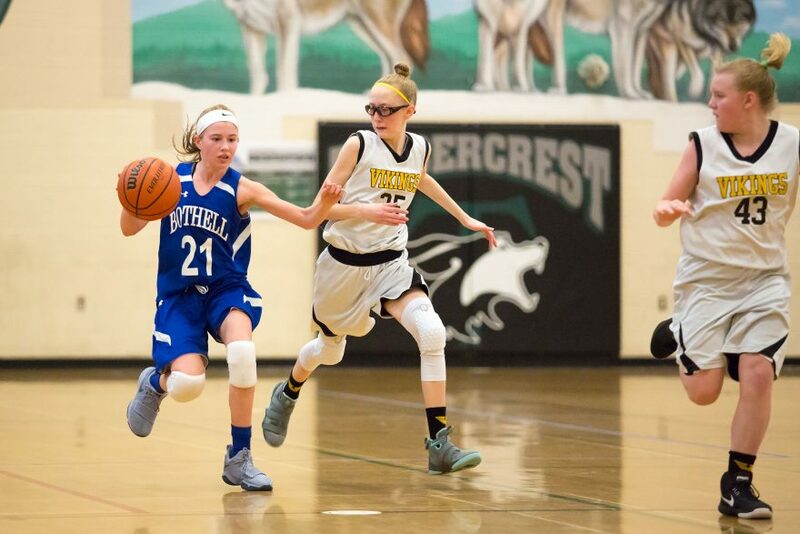 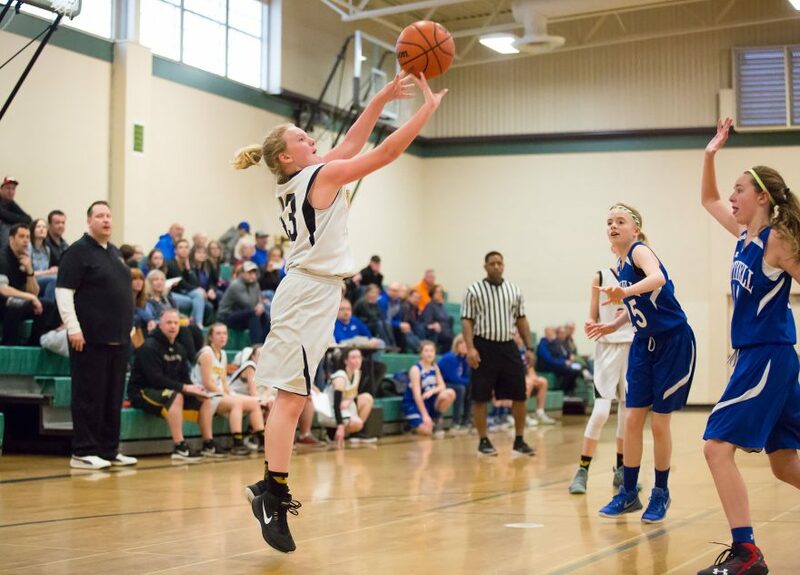 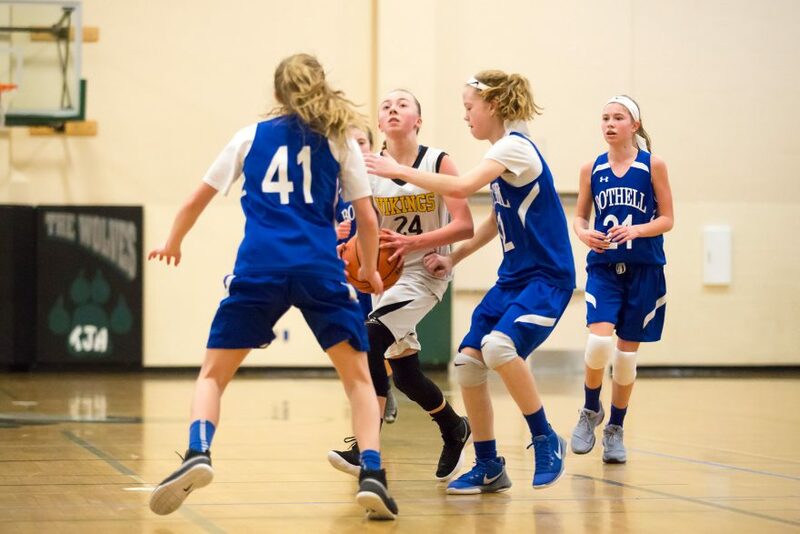 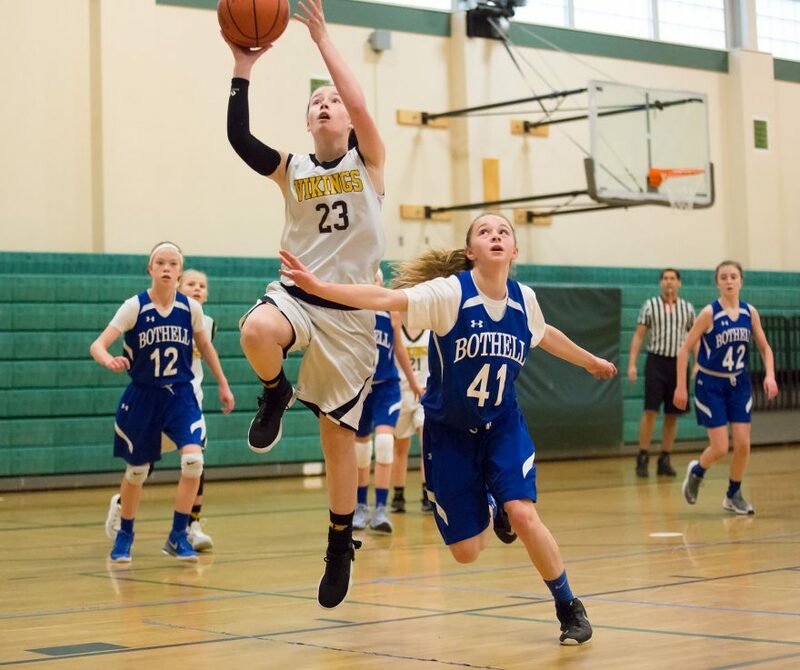 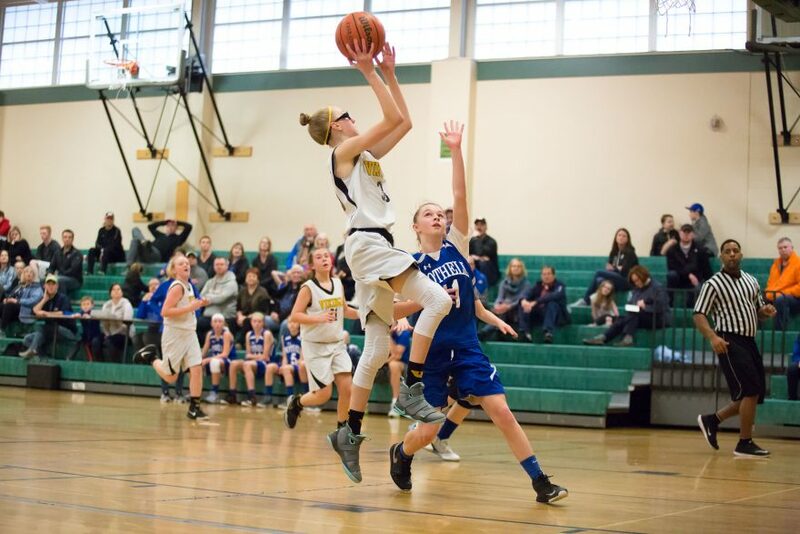 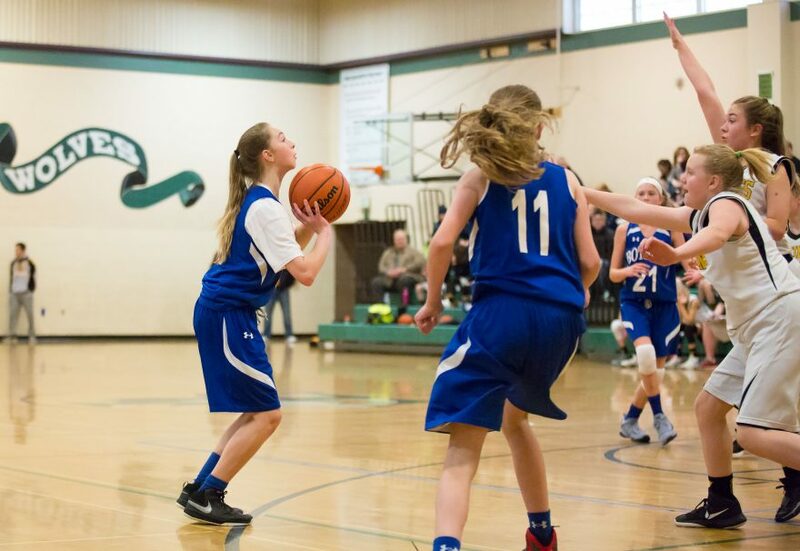 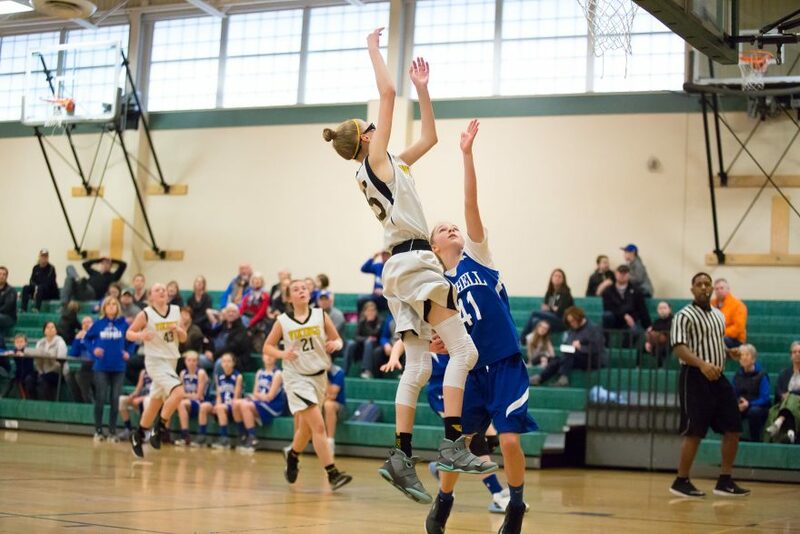 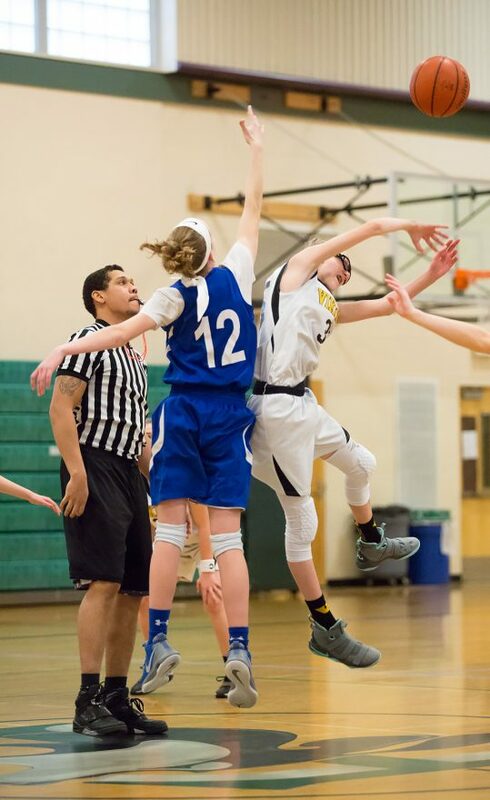 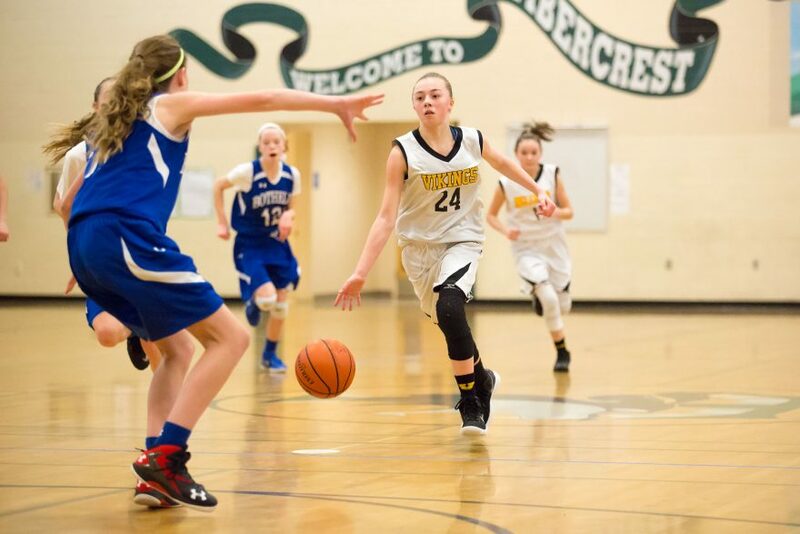 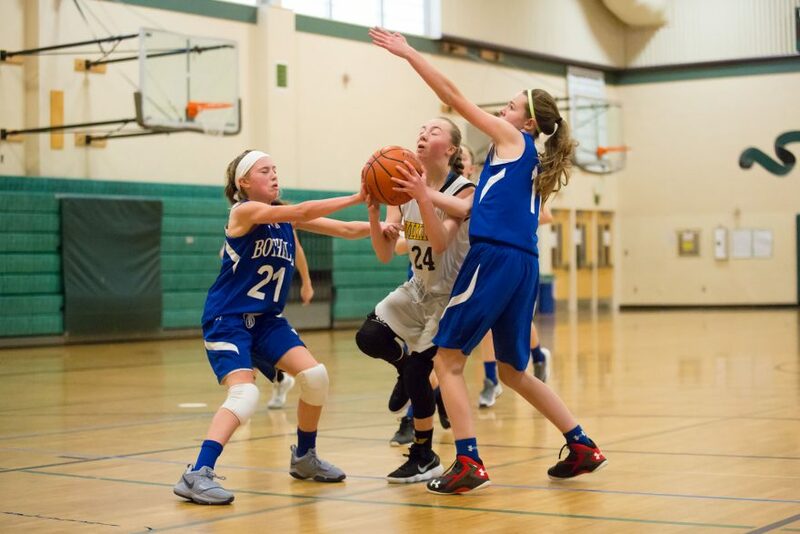 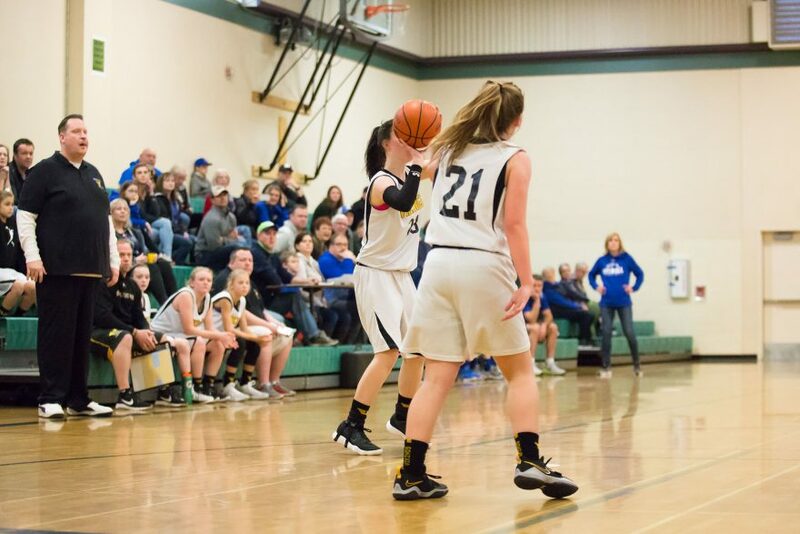 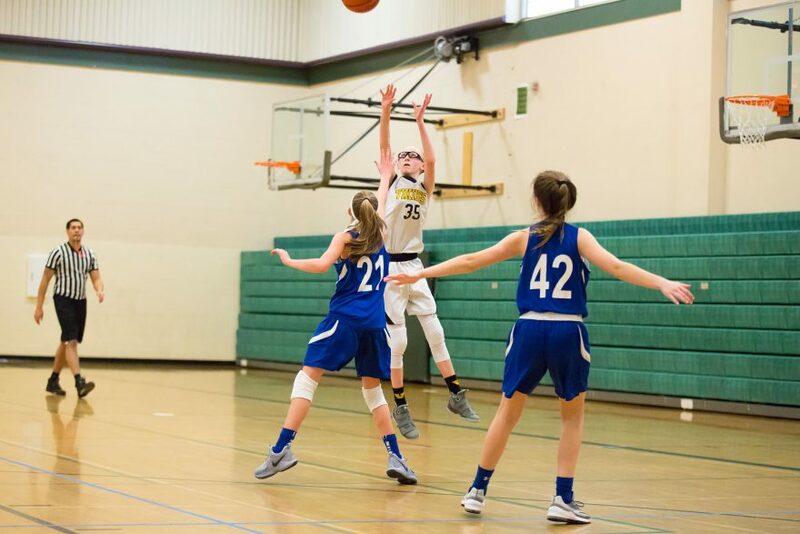 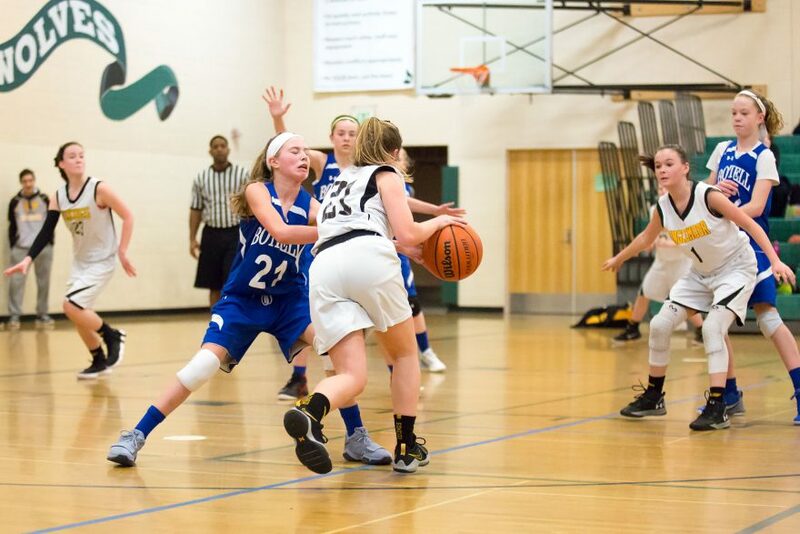 In what must have been a frustrating game for both teams, the Bothell Cougars and Inglemoor Vikings met between the hoops at Timbercrest Junior High in Woodinville on Saturday afternoon. 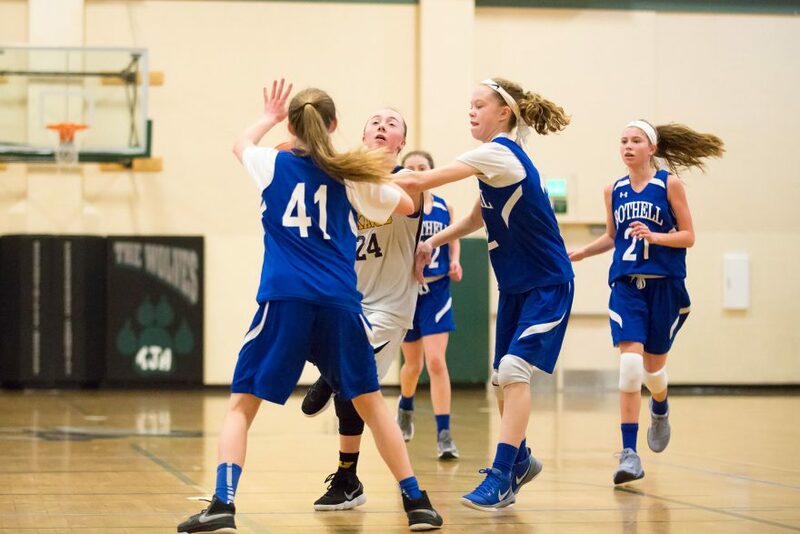 Perhaps rusty from the winter break, both teams were hampered as much by shaky offense as strong defense from their opponents. 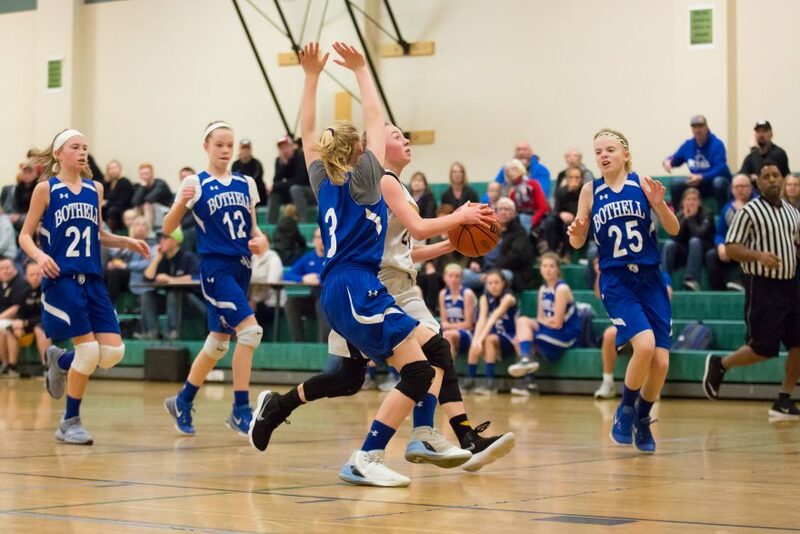 The close, low-scoring game was plagued by missed free-throws, missed layups, and missed 3-pointers that would normally have been easy for the players involved, but the balls just weren’t finding the net. 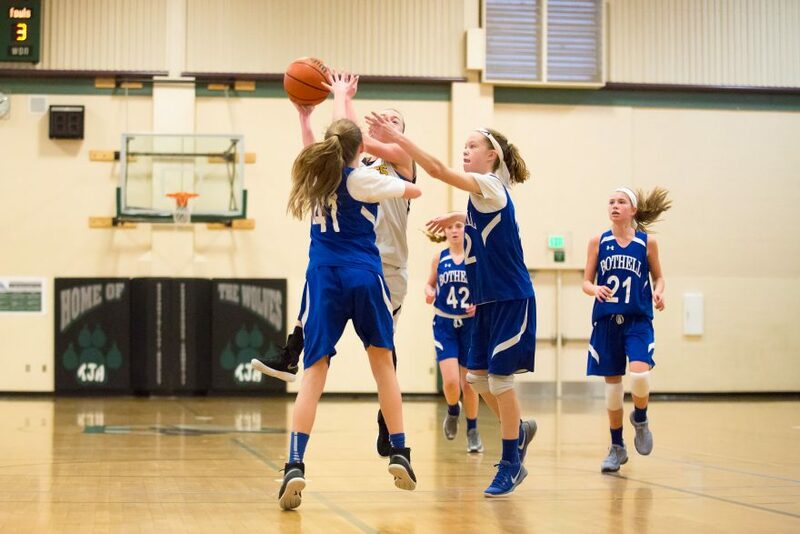 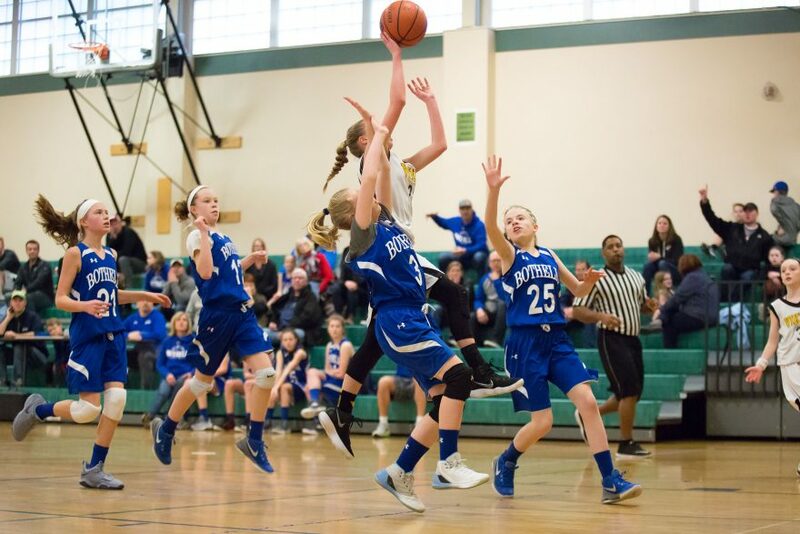 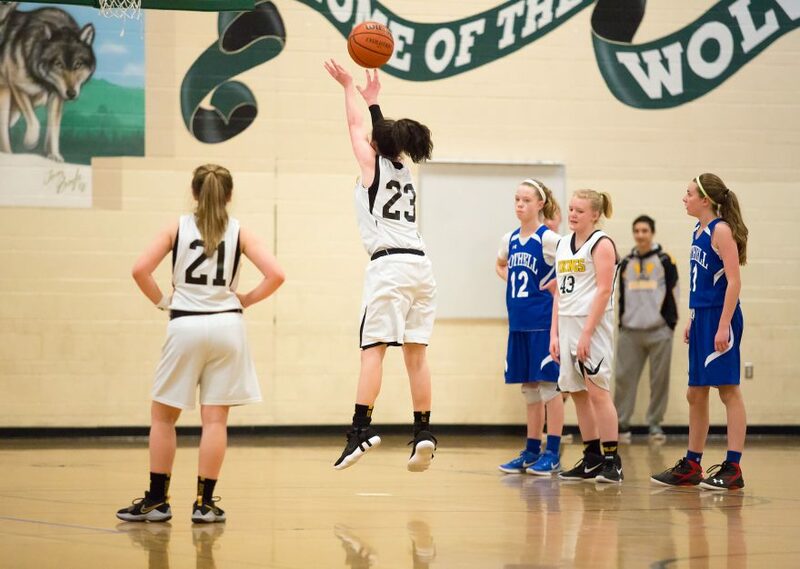 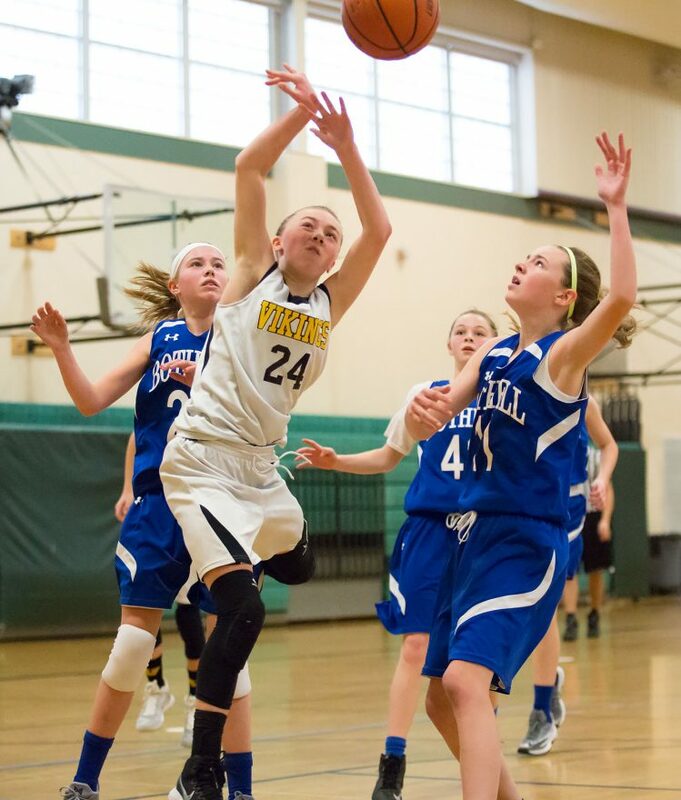 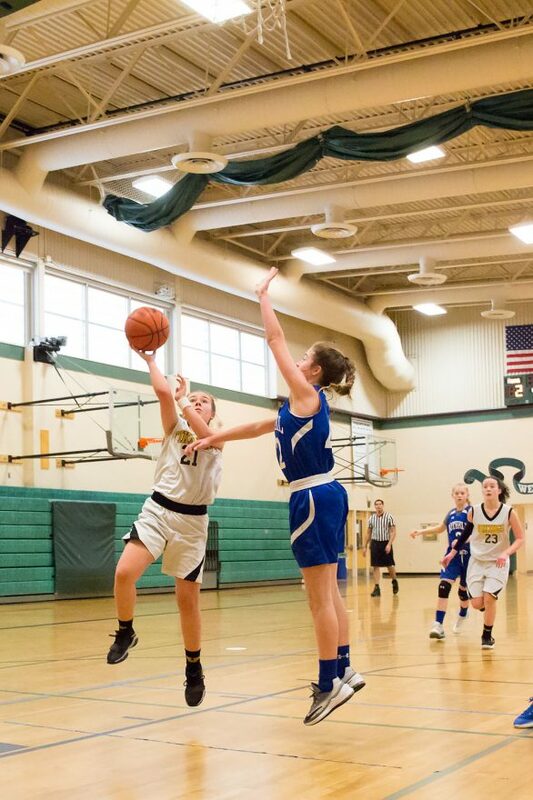 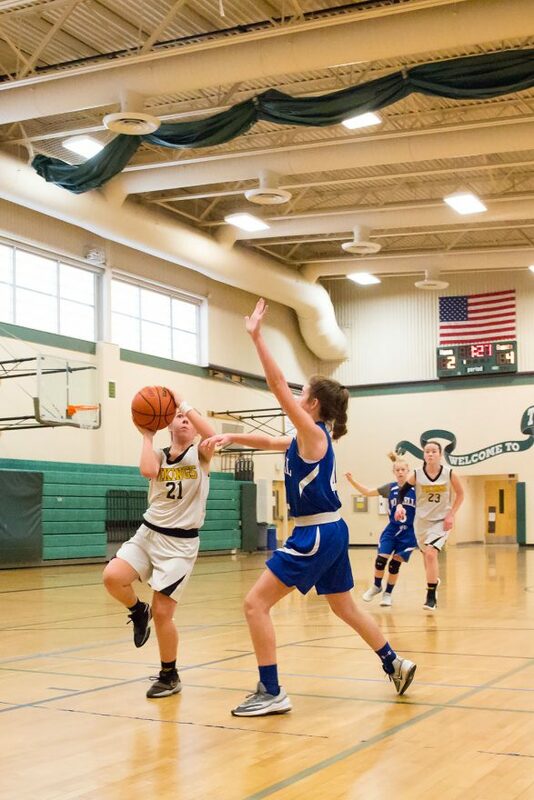 It was not for lack of effort, though; the girls played with passion on offense and fiery resolve on defense. 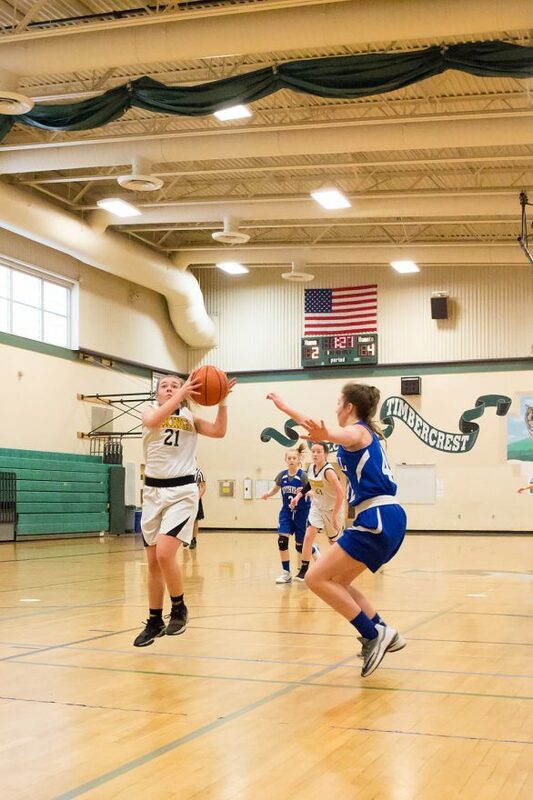 The first quarter started slowly, with several scoreless possessions in the two minutes before Inglemoor hit their first shot from the paint. 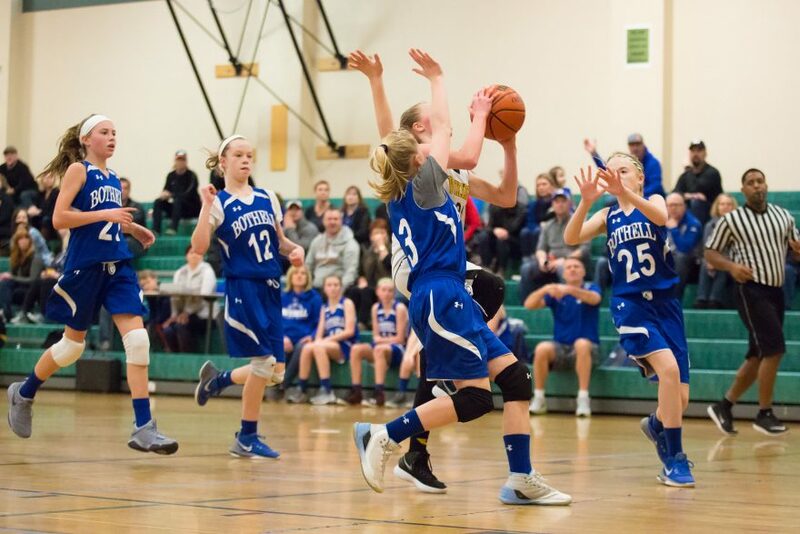 After two more minutes, the score was matched by a Bothell field goal, and then they pulled ahead with a pair of free-throws, 4-2. 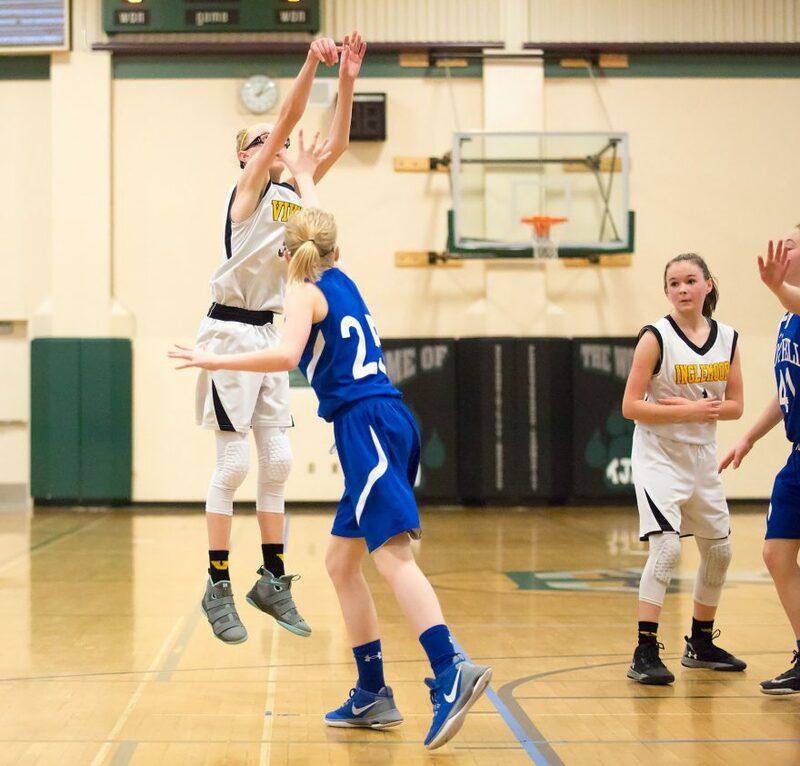 With 30 seconds remaining in the quarter, another of Inglemoor’s shots finally sunk to tie the game at four points each. 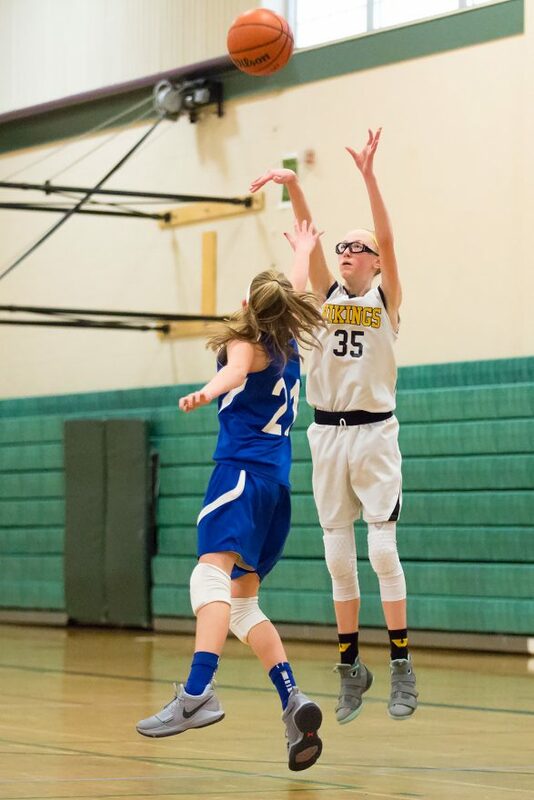 To begin the second quarter, the Vikings put two points on the board and then followed it with a free throw just ten second later, pulling out to a 3 point lead, which would be the biggest point differential until the the end of the 3rd quarter. 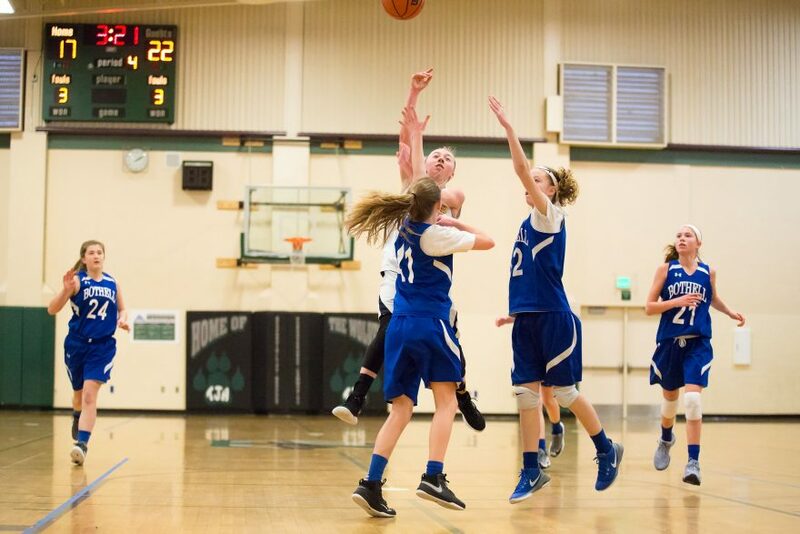 A minute later, the Cougars closed the gap with their own two points, and then tied the game with a free-throw. 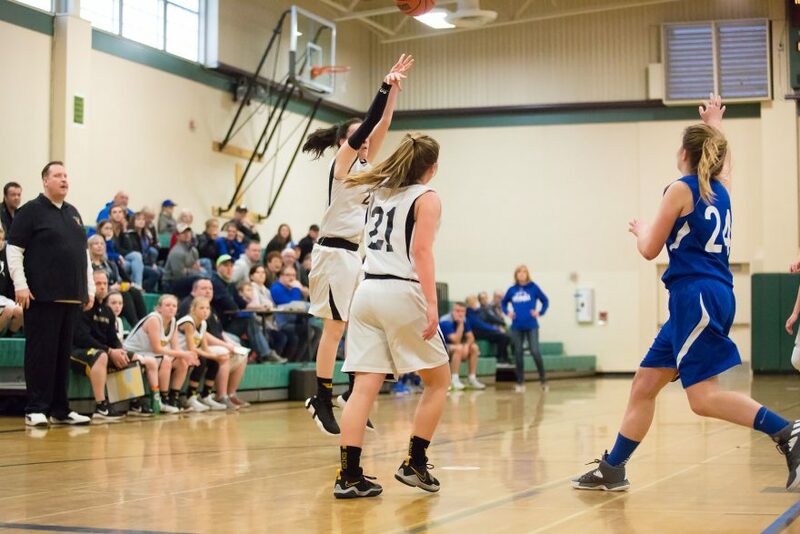 With two and a half minutes left in the quarter, the offense picked up. 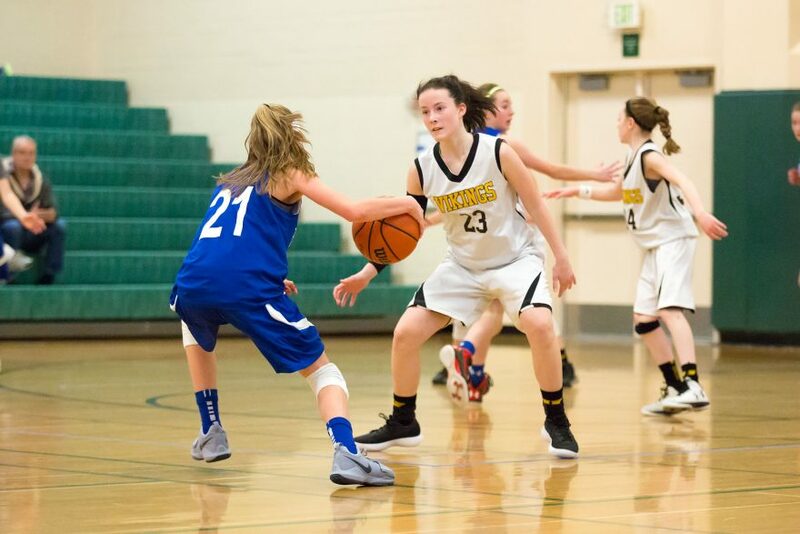 Inglemoor and then Bothell scored two points each, and then Bothell hit a free-throw to pull ahead 10-9 with a minute remaining. 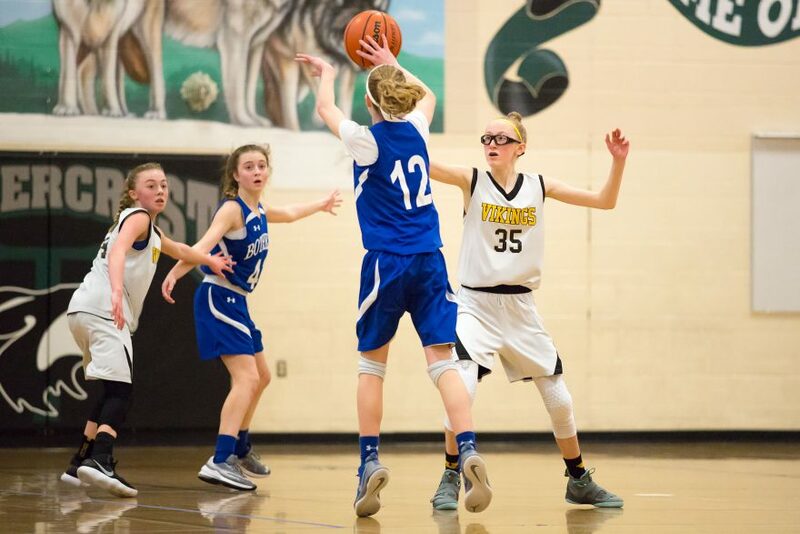 The Vikings regained the lead with a layup shortly afterward, though, and looked as though they’d carry it into halftime, but with the clock winding down below 10 seconds, the Cougars hit another shot to enter halftime with a narrow 12-11 lead. 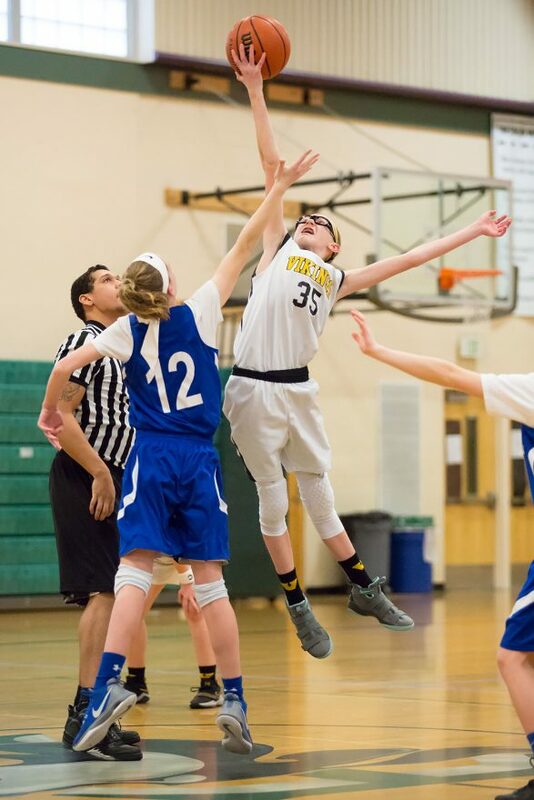 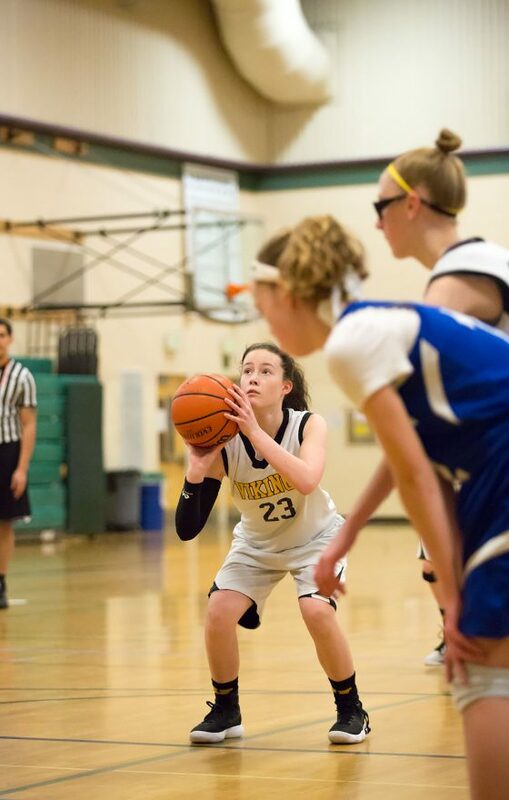 To put that in perspective, the same Inglemoor team scored 21 points in a single quarter in their game against Newport, while both teams combined for only 23 points in the entire first half in Woodinville. 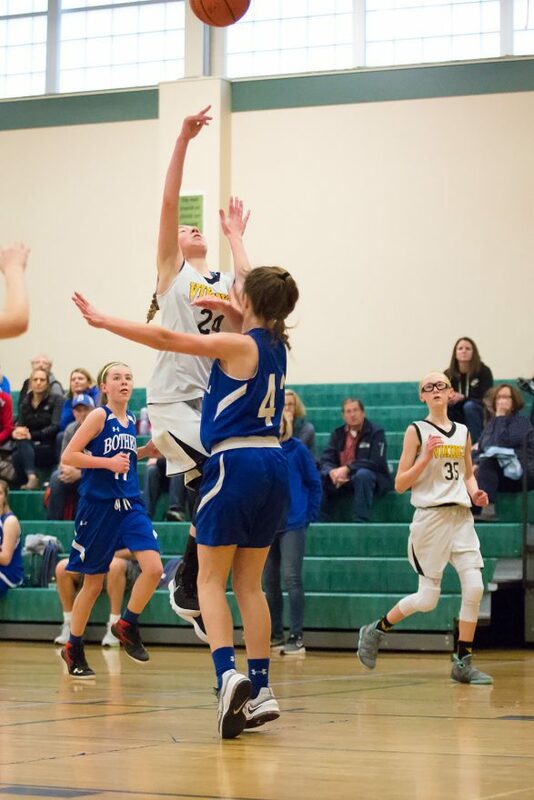 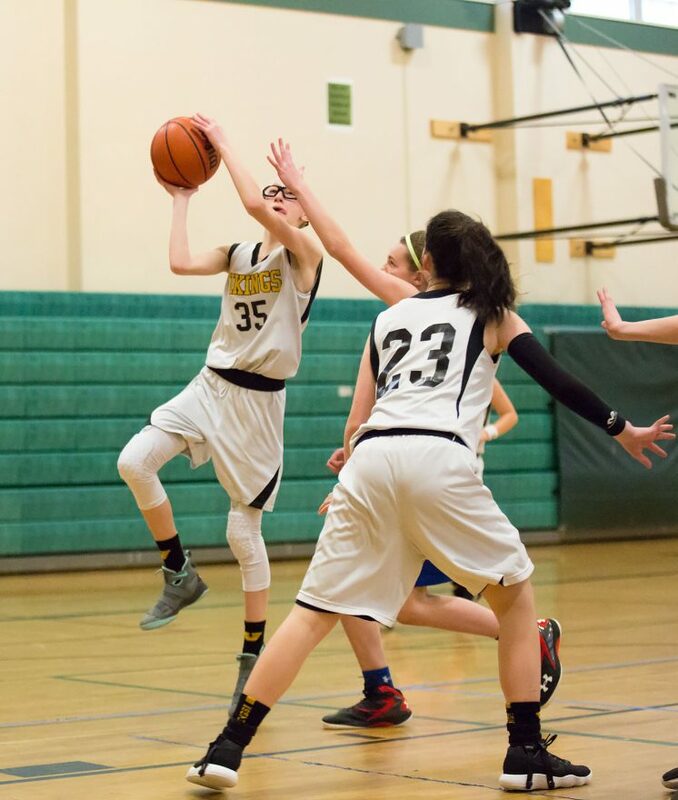 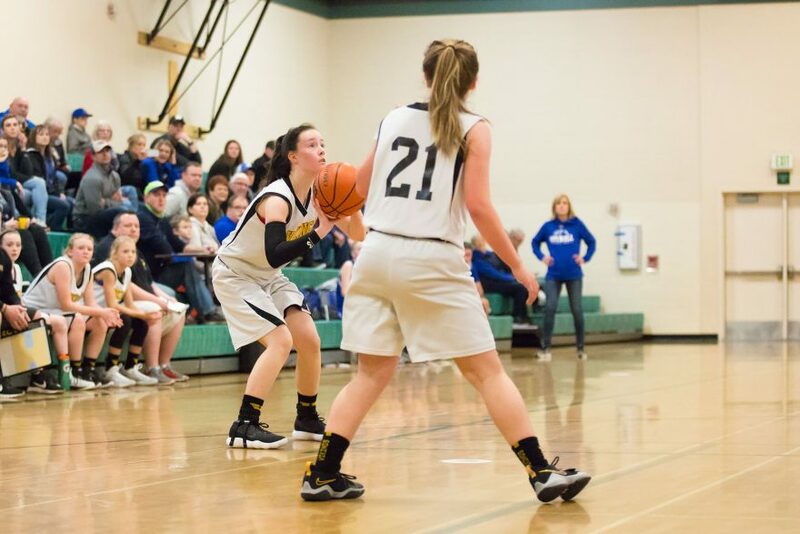 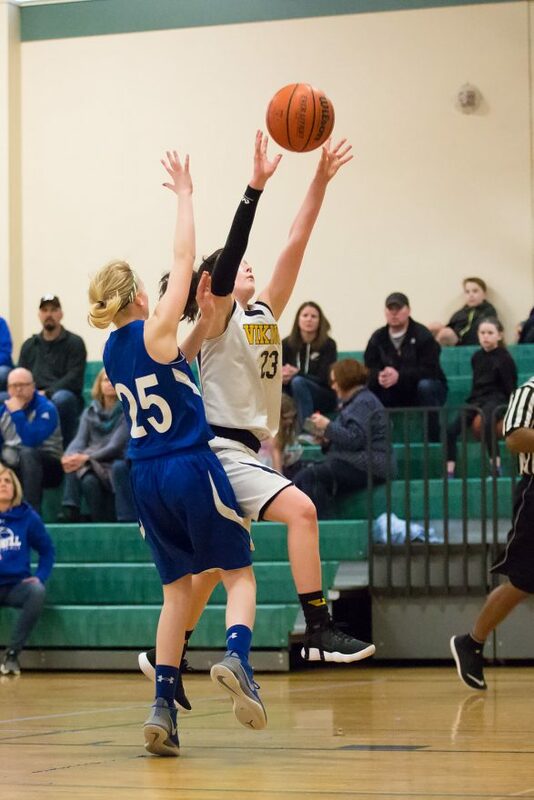 Strong defense play by both teams played a part in this score, with a few jaw-dropping blocks made by Inglemoor, and several skillful steals by the Cougars, but the offensive woes were also hard to ignore. 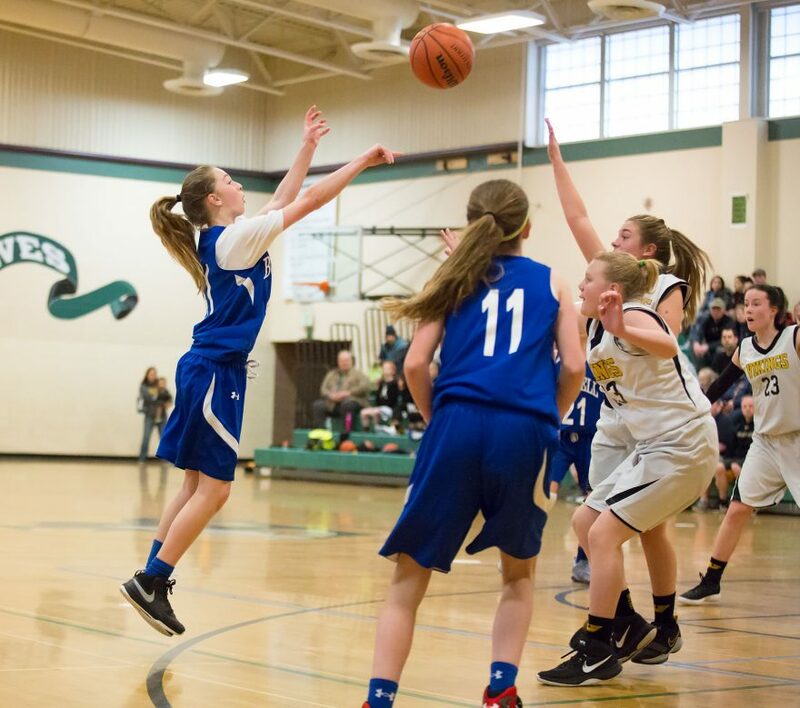 Through the first five minutes of the third quarter, both teams scored two points each, bringing the score to 14-13. 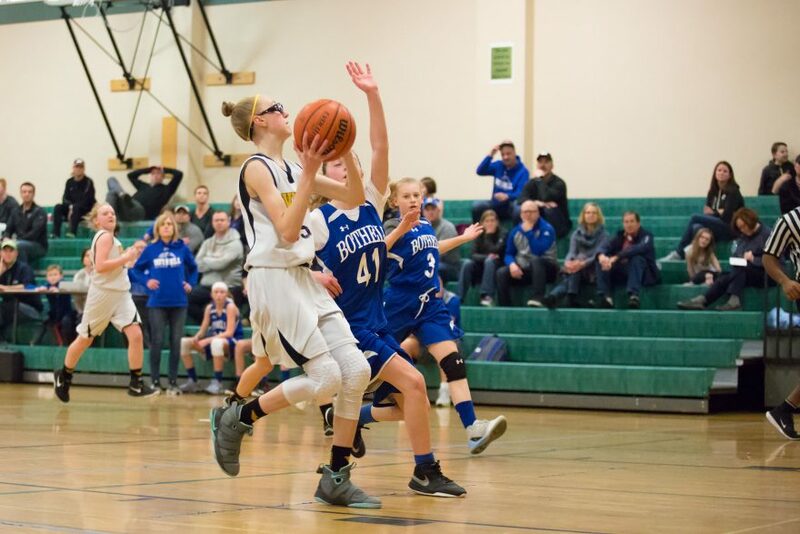 After a Bothell free-throw, both teams hit one more shot in the quarter, and Bothell entered the 4th with a one-shot lead, 17-15. 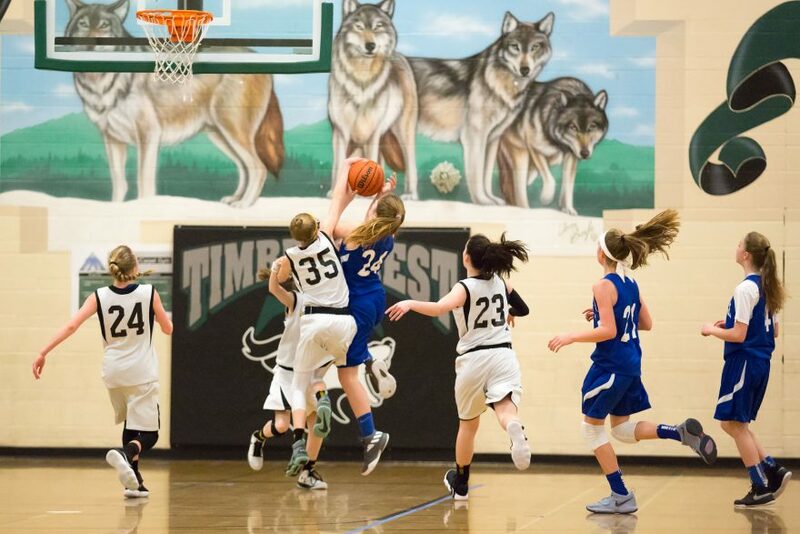 But then, for a few minutes, Bothell broke free and started hitting their shots. 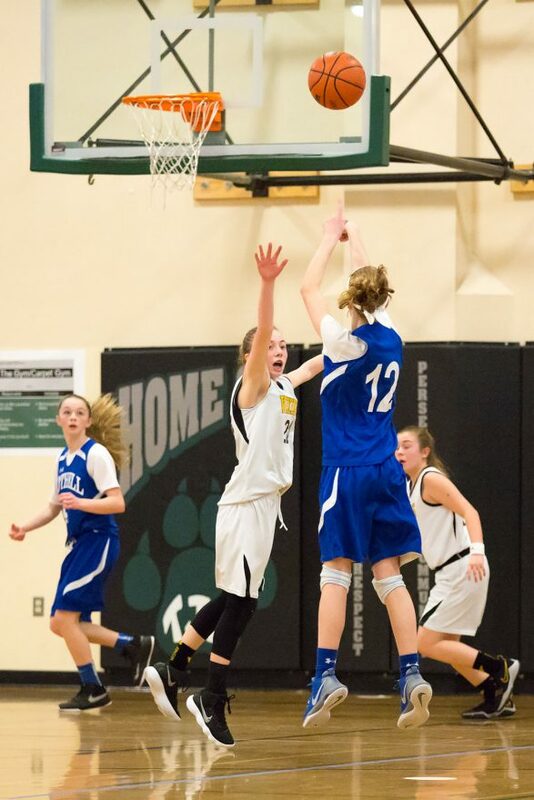 After another free-throw and two buckets, Bothell held a daunting 7 point lead (22-15). 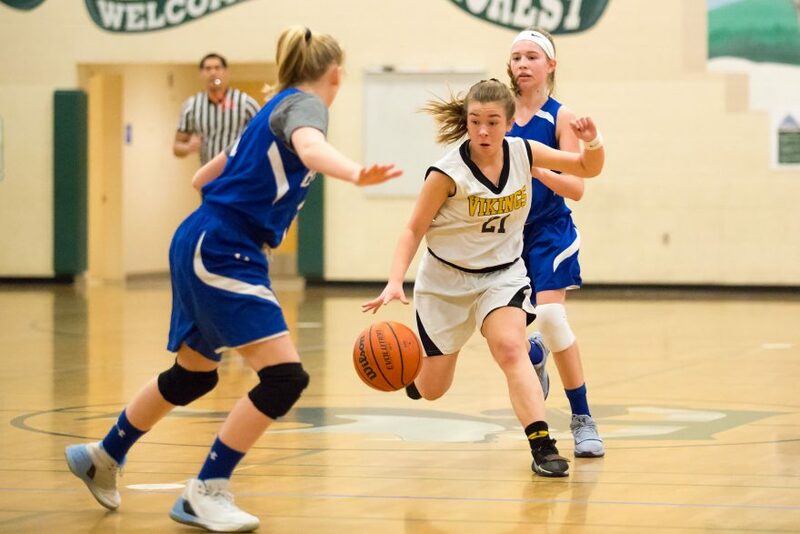 After those three and a half minutes, both teams returned to trading scores, each adding another 4 points, but Inglemoor was unable to answer the Cougars’ rally, and Bothell won 26-19.